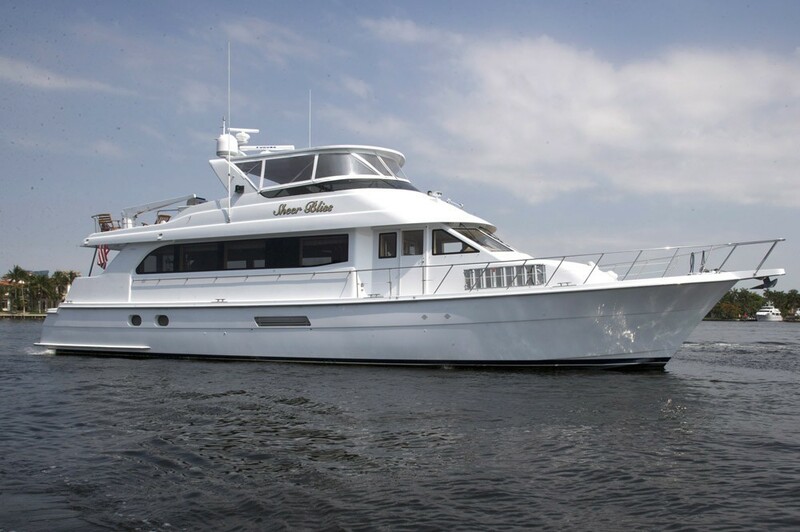 Luxury motor yacht Sheer Bliss is a 22m (75') Hatteras built in 2001. 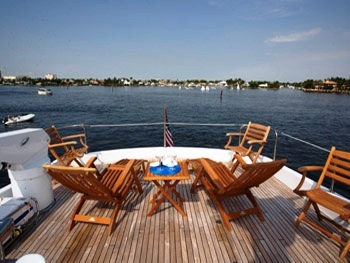 Sheer Bliss is based in Florida and the Bahamas year round and can accommodate up to 6 guests in 3 well appointed staterooms. Charter Yacht Sheer Bliss has a Custom satin gloss maple interior. 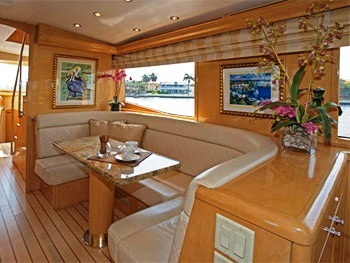 Her saloon boasts an L-shaped sofa with beige chenille fabric, two occasional chairs and a glass/iron cocktail table. Her adjoining dining area offers a Circular dining table for 6 guests to enjoy the fine cuisine offered on board. 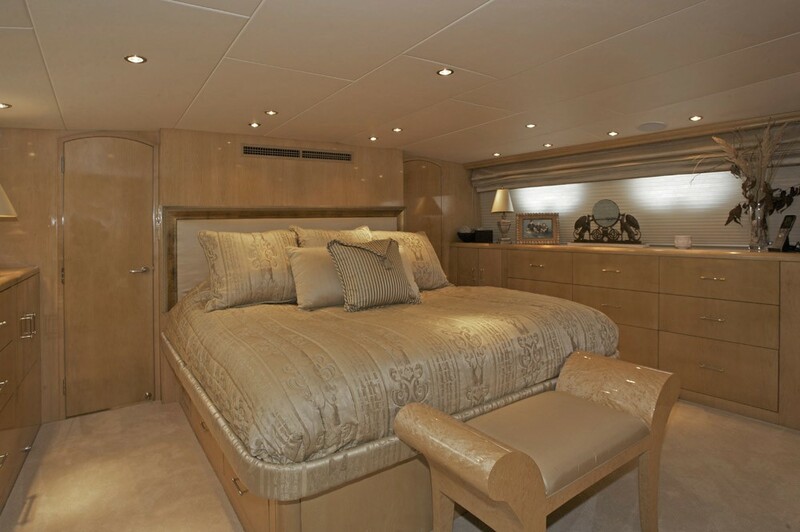 A stairway opposite the dining area leads to the aft master stateroom. 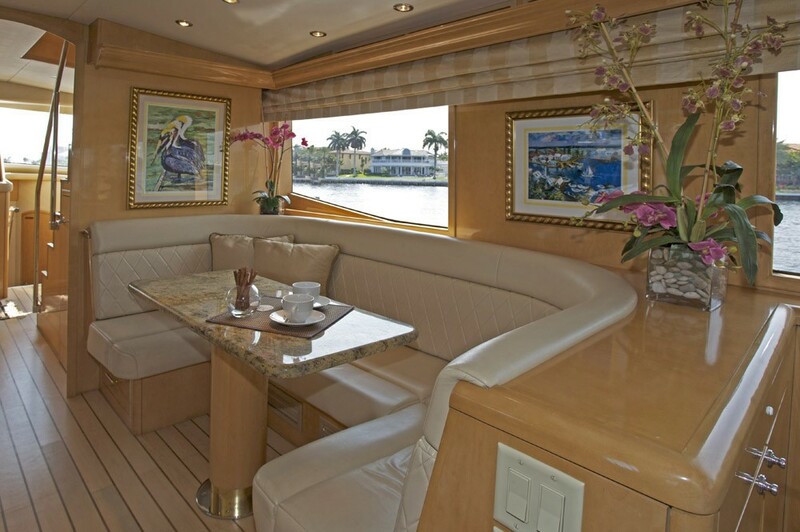 Sheer Bliss’s Galley opens to the salon with U-shaped seating breakfast table starboard side for informal dining. 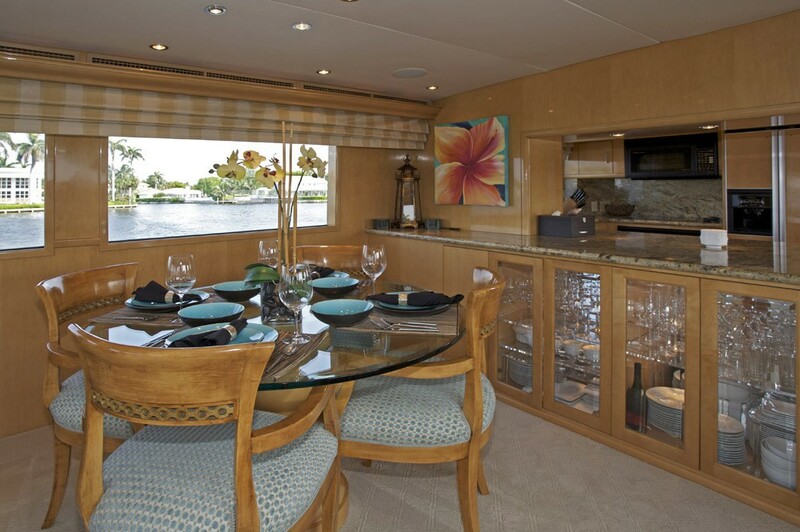 The well equipped Galley has granite table tops. 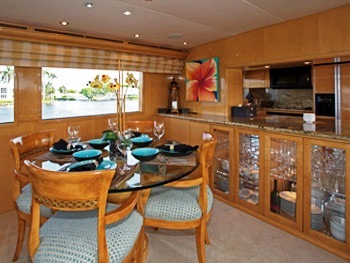 Sheer Bliss has a fantastic spacious teak aft deck with Wet bar and refrigerator. 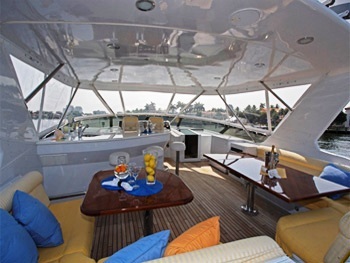 There is also a Stereo control pad and outdoor speakers. TV. 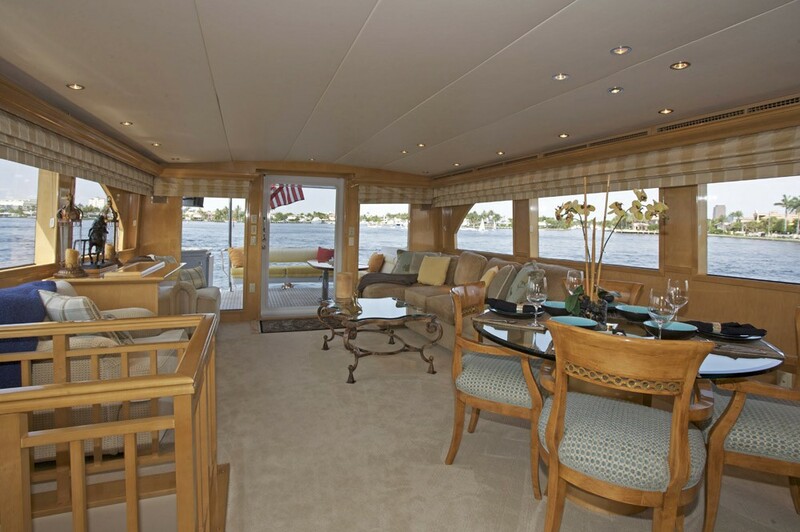 So you can enjoy the music both inside and out. 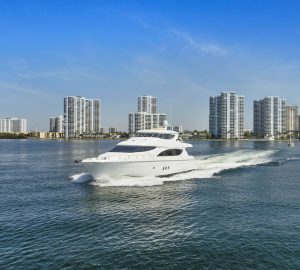 Up on the spacious flybridge, there is a Wet bar with a seating area and stools as well as two comfortable sized seating areas with large tables. This area boasts a Refrigerator, wine chiller, ice maker large freezer and a, BBQ grill. 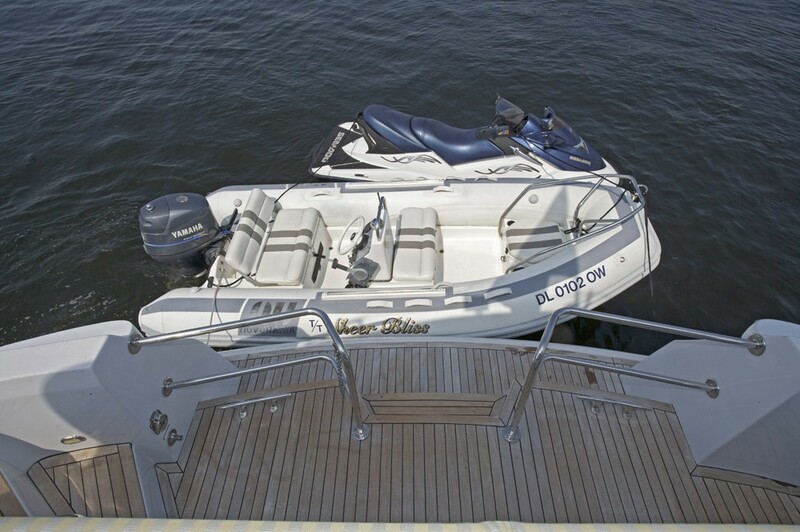 The Enclosure with hardtop is perfect for protection for the elements. 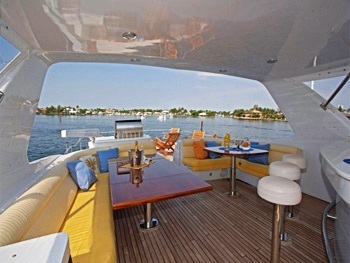 There is also a . TV, stereo control pad with outdoor speakers. 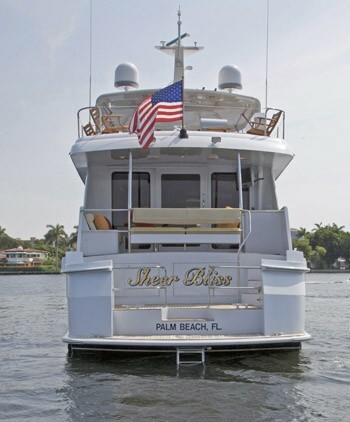 Sheer Bliss has a broad selection of water sport toys and is the perfect yacht for couples or a family to explore the Florida or Bahamas, offering comfort and style on an affordable budget. 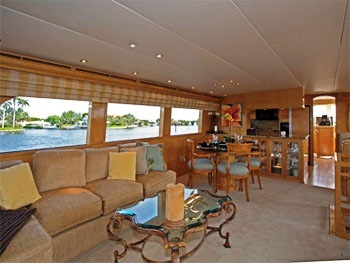 Florida and Bahamas based Sheer Bliss can accommodate a maximum of 6 guests in 3 well appointed double staterooms. 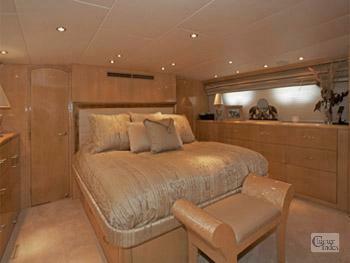 Her Master Stateroom is situated Aft and has a King-sized bed with drawer storage and cedar-lined closets. 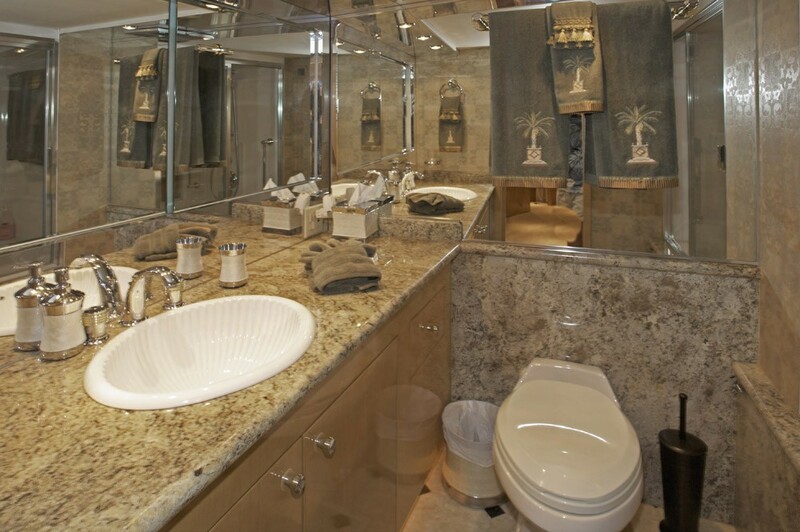 This cabin boasts Private his and her heads with granite vanity and custom fixtures. 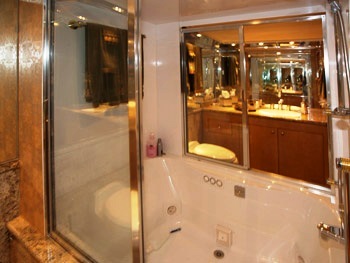 The ensuite also has a Spa Pool tub and shower. 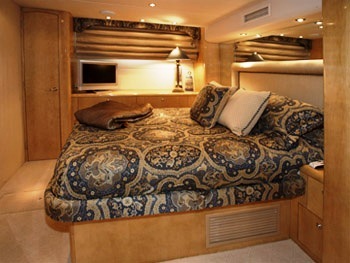 The cabin is also equipped with a Flat screen TV with CD/DVD player. 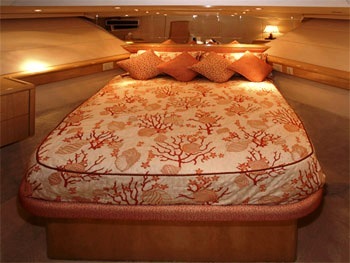 Sheer Bliss’s VIP Stateroom is situated Midship with a Queen-sized bed with ample storage, cedar lined closets. 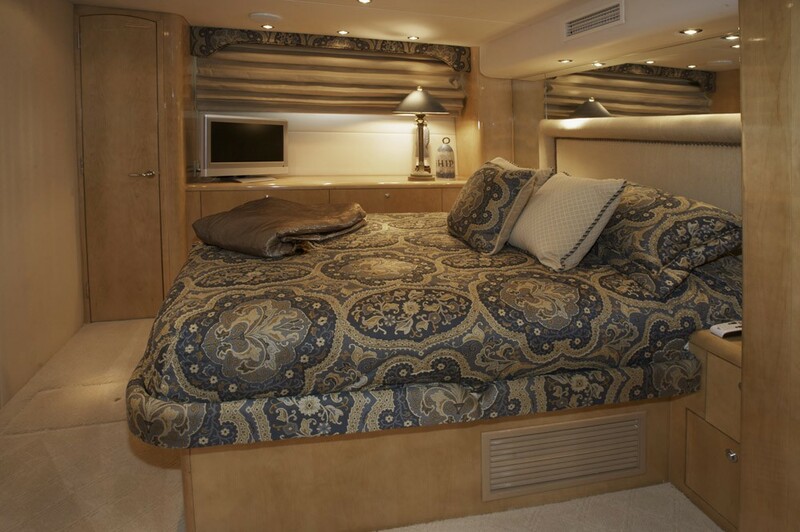 The cabin is equipped with a 20” flat screen TV with DVD, Stereo control pad, Ensuite head with shower vanity. 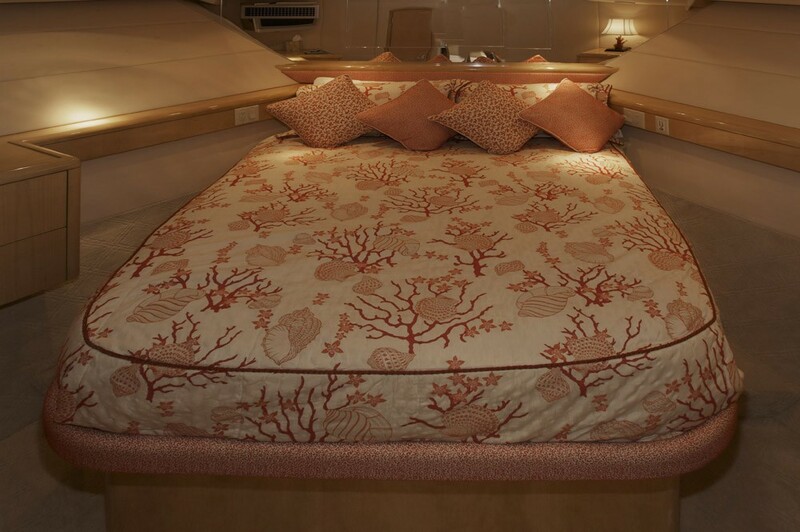 The final Guest Stateroom is situated in the forward with a Queen-sized bed with ample storage, cedar lined closets. 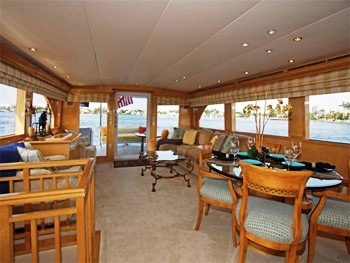 This Cabin also has a 20” flat screen TV with DVD and Stereo control pad. 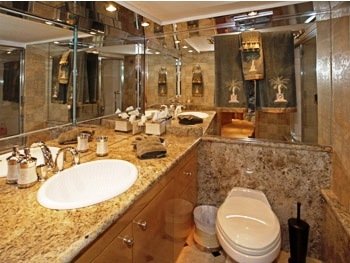 Ensuite head with shower and vanity. 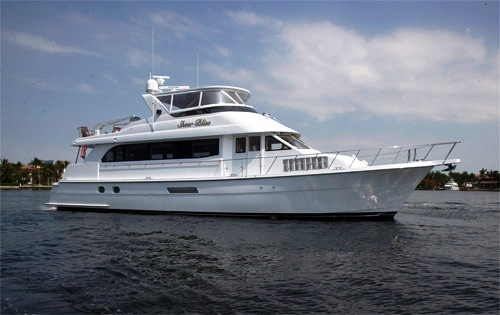 Motor Yacht Sheer Bliss has the following Tender & Toys and amenities: 15’ Novurania w/50hp, 1x 3 person Seadoo, Snorkel gear, Air sled that tows behind tender, Weight bench, Dumb bells, Stationary bike, Air stepper Communications including a Iridium Cell phone, Standard Horizon VHF Radio, Audio Visual Equipment and Deck Facilities including: Aft Deck: Wet bar with refrigerator. Stereo control pad and outdoor speakers. TV. 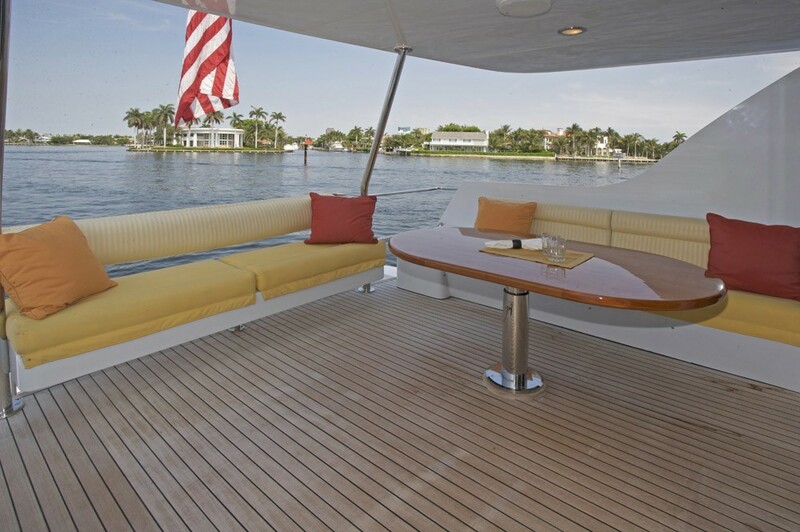 Teak decks. 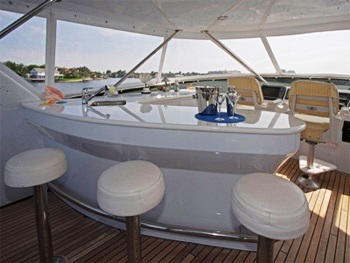 Fly bridge Deck: Wet bar with seating area and stools. Two comfortable sized seating areas with large tables. 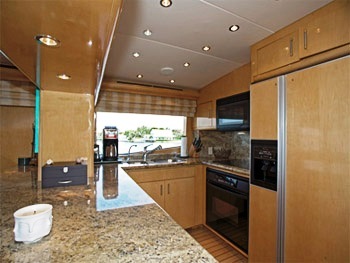 Refrigerator, wine chiller, ice maker large freezer, BBQ grill. 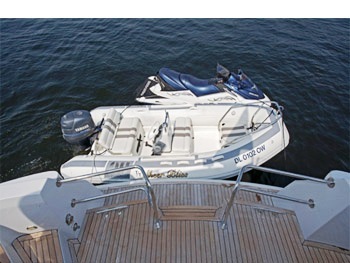 Enclosure with hardtop. TV, stereo control pad with outdoor speakers.